It is Friday night and I have been working all day on styling some food for an important client and I totally forgot about dinner, but luckily I had in my fridge this amazing Ancho Chilli Sauce I made yesterday, so quick thinking!!! What can I do in a hurry? Yes! Enchiladas! Good! The good thing about enchiladas is, like tacos, you can fill them with almost anything you want, in this case the only thing I had in my fridge was cheese, feta cheese to be exact, so there, we will have feta cheese enchiladas, but you can always fill them with refried beans, shredded chicken, shredded beef or mince meat, the secret is in the salsa, get the salsa right and you will have the most delicious enchiladas ever! Clean the ancho chillies with a wet kitchen paper towel. Take the stem and seed off and put them in hot boiling water for 10 min to soft. Once they are soften, put them in a blender together with the tomatoes, onion, garlic and salt. Blend until getting a smooth consistency. Once the salsa is done, put it in a frying pan to cook. Mix from time to time, cook for 15 min in low heat. Set aside. Keep it hot. Make sure your salsa is hot. Have the feta cheese ready and the plate where you are going to put the enchiladas. Heat your tortillas, one by one. A lot of people fry their tortillas before immerse them into the salsa, so they do not fall apart, but I was in a hurry that I skipt that. I was very careful when taking the tortilla out of the salsa. Once the tortilla is heated, smoother it in the ancho salsa and fill it with fetta cheese. Then roll the tortilla carefuly and do the rest one by one. 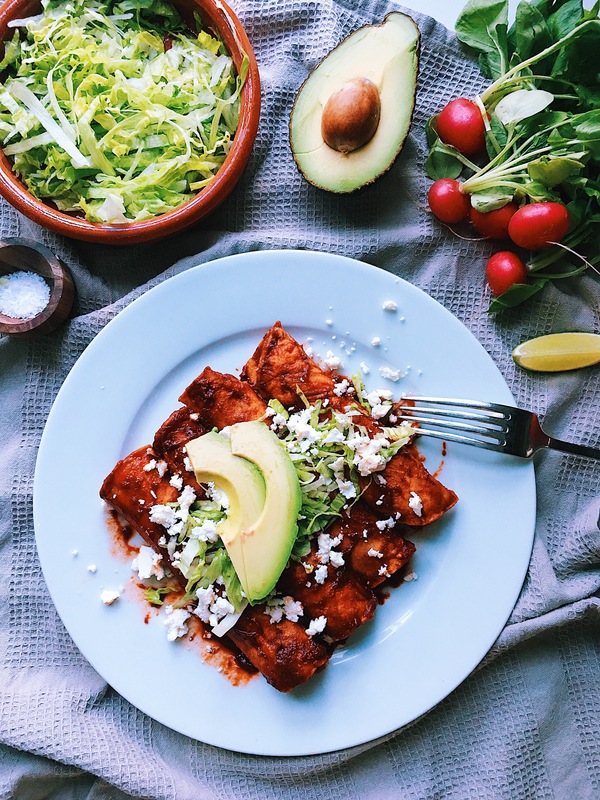 Top the enchiladas with shreded lettuce, more feta cheese, avocado slices and sour cream. Enjoy!